LISTEN TO NEW RESEARCH & ADVICE FROM DR. AMADOR! We are proud and excited to announce the publication of the first ever audio edition of: "I am not sick I don't need help!" 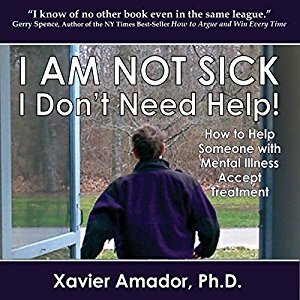 How to help someone with mental illness accept treatment, by Dr. Xavier Amador (Vida Press, 2016). Narrated by Dr. Amador, this edition includes additional new material not included in the 10th anniversary edition of the book! Like the best selling print versions of the book, the audiobook is for both Doctors/Therapists and Family Members. Dr. Amador took special pains to add additional new advice on how to use the LEAP method to overcome resistance, anger, paranoia, and even estrangement from loved ones and patients who become isolated from the people who most want to help them. He also includes new research on the power of relationships and how we can use them to help our loved ones and patients accept treatment. Click here to listen to a free sample on Amazon of this most up-to-date edition of the award winning and international bestselling book that has helped millions. I Don't Need Help! Now Available For All EBook Readers! "This book fills a tremendous void…" wrote E. Fuller Torrey, M.D., about the first edition of I AM NOT SICK, I Don't Need Help! Ten years later, it still does. Dr. Amador's research on poor insight was inspired by his attempts to help his brother Henry, who developed schizophrenia, accept treatment. Like tens of millions of others diagnosed with schizophrenia and bipolar disorder, Henry did not believe he was ill. In this latest edition, 6 new chapters have been added, new research on anosognosia (lack of insight) is presented and new advice, relying on lessons learned from thousands of LEAP seminar participants, is given to help readers quickly and effectively use Dr. Amador’s method for helping someone accept treatment. I AM NOT SICK, I Don't Need Help! is not just a reference for mental health practitioners or law enforcement professionals. It is a must-read guide for family members whose loved ones are battling mental illness. Read and learn as have hundreds of thousands of others…to LEAP-Listen, Empathize, Agree, and Partner-and help your patients and loved ones accept the treatment they need. "I strongly recommend this book for [both] families and therapists." Now Available for Kindle and all other Ebook readers! Click Here. 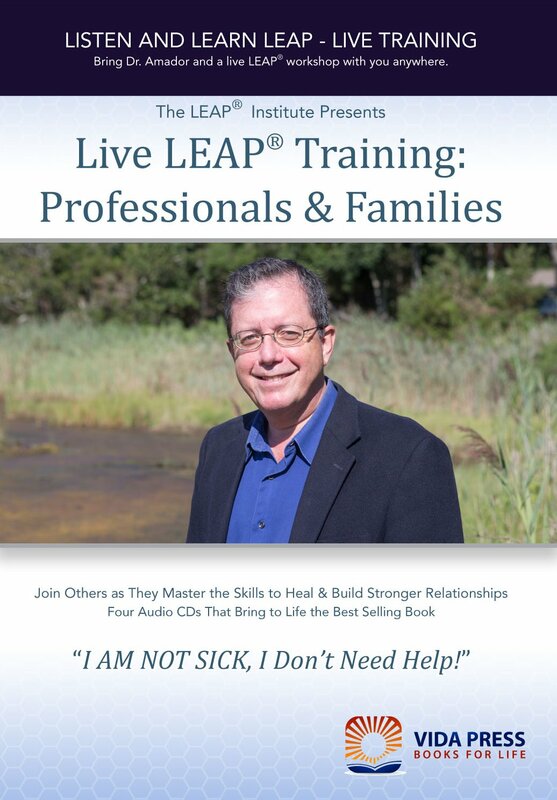 Listen and identify with professionals and family caregivers as they learn how to break through resistance and "denial" using LEAP. Listen to powerful role-plays that bring to life the experience of persons with mental illness who too often lack insight (have anosognosia) and end feeling alone, frightened, and angry. They understandably refuse treatment and your help. In this companion video to the best-selling book, I AM NOT SICK, I Don't Need Help! you will learn how to use LEAP, which shows healthcare professionals, first-responders and family members how to partner with people with mental illness, even when they don't believe they're ill! You will learn the seven LEAP tools and watch as Dr. Amador demonstrates their use in role-plays. 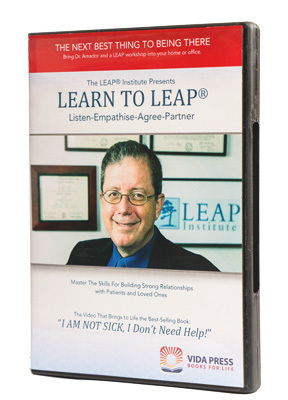 The DVDs capture an intensive LEAP Training given by Dr. Amador, and come with an interactive menu so you can jump ahead to topics that are pressing, go back to practice LEAP tools, or skip to important research or role-plays you want to share with others. The video takes you beyond the book by showing you LEAP and Dr. Amador in action. Available only here! Personalized and autographed copies of: "I'm Right, You're Wrong, Now What?" Stop arguing and LEAP to break the impasse!